Out of the box, the Expert Mouse is simple to install and set up. 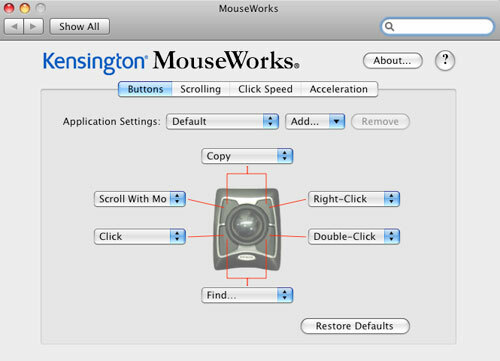 Plug the USB cord into your Mac, go to Kensington’s website and download the latest version of MouseWorks, install it and then set your preferences for what you want each of the four main buttons to do, set your click and scrolling speed and the pointer speed and you’re good to go. Want to open up an application? No problem, set it up in preferences as to what button you want to use and off you go. Launch a particular URL… set it up and away you go. The unit itself is designed as 5 3/4″L X 1 1/2″H X 5″W with the end closest to your hand being less than 1/2” in height. Kensington solved this problem of the unit being so sloped by providing the user with a padded palm rest that easily attaches to the low end and slopes your hand up into a more comfortable position. Once you’ve set up your Expert Mouse, the first couple of hours are normally spent just getting used to the feel and the capabilities of the mouse. The six-foot USB cable should prove to be more than enough for most users to set the mouse up comfortably on their desktop and not feel restricted. Choosing what button on the unit does what can be an interesting experiment in itself. I found that I changed my first selection of button use once I became more familiar with the unit and discovered that it was far easier for me to utilize the top left button to scroll, the top right button to go back/forward, open in new window; the bottom left button to click and the bottom right button to double-click. The nice thing about Kensington’s MouseWorks is that is does work and it doesn’t cause any problems with the operation of the Mac, unlike some other software. 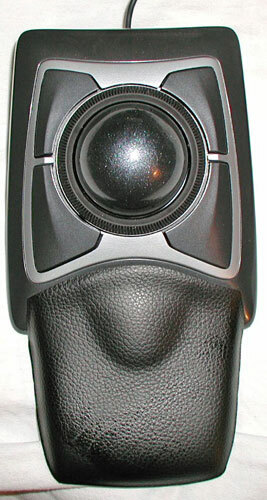 I found the trackball to be great, quiet, smooth and easy to use. The use of the trackball to scroll is just fantastic in its ease of use and control, and with the bottom left button set as the click, I’m easily out of the scroll mode and able to move the cursor to where I want and then use the bottom right button to double-click and open a link. The one issue that I did have is that the Scroll Ring just did not seem to work the way it should. I found that no matter where I had the scroll speed set to, in using the Scroll Ring the movement was jerky and at times, I wound up right back where I started from. Utilizing the trackball in scroll mode solved that issue right away but I was disappointed in the way the Scroll Ring just didn’t seem to work the way I thought it should. Despite that issue, I would still highly recommend the Expert Mouse to anyone looking for something more than just a plain old mouse. Pro: Easy to use, easy to program, good number of programming options available to the user; use of trackball to scroll was great. Great warranty on the product. Cons: The one problem that I had was with the Scroll Ring, just could not find a comfortable movement to make scrolling as good as it is otherwise. System Requirements: Macintosh running OS X or later with an available USB port. Internet connection or CD-ROM drive to install the software. Warranty: Kensington 5-Year Warranty and free technical support.